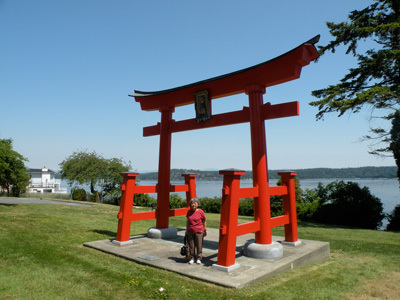 Do you know there is a genuine Torii Gate from Japan in Canada? The Torii is a common sight in Japan but is unique in North America. Yes, there is one in Campbell River on Vancouver Island. It is located in Sequoia Park right across from the Museum in Campbell River. In the Museum the Matsunaga family’s cod boat the “Soyokaze” which was confiscated during World War II is on display. The Torii was a gift from the people of Ishikari, Hokkaido to celebrate ten years of twinning. It is known as the “Ishikari Gate”. It was built in Japan and assembled here on site in 1993. The plaque with Japanese lettering displayed on the cross piece is written in Kanji, the traditional writing style in Japan and says “Ishikari”. Campbell River’s gift to Ishikari was a totem pole carved by renowned local artist Bill Henderson. The pole was placed in a prominent setting beside the Ishikari City Hall in the Fall of 1993. In 1983, Campbell River signed a twinning agreement with Ishikari to promote an exchange that would mutually benefit each of the communities. One measure of the success of the twinning program between Campbell River and Ishikari is the number of citizens that have left their homes and schools to stay in each of the twin cities for a few days or for a year-long homestay. Over 800 citizens have travelled back and forth between our two communities since the beginning. Economic, cultural and educational benefits have enhanced the many ties of friendship. Two programs have been established for students. Every year, the Senior Exchange Program chooses two secondary students from each city to attend school in their twin city where four or five families host them. In the Young Ambassador Program every other year around 30 younger students stay with a host family for ten days. In 2008, the two cities celebrated their 25th anniversary of the twinning agreement by visiting each other’s city. The former Consul-General of Japan in Vancouver, Mr. Seiji Otsuka was invited to be one of the witnesses of the new proclamation of the sister city agreement signed by the Campbell River and Ishikari Mayors on June 30, 2008 in Campbell River. I was fortunate to be one of the delegates to participate in the 25th anniversary celebration held in Ishikari in September 2008. Now the Torii at Sequoia Park has company, a 34-foot totem pole. The new totem pole honours the Sewids, a local First Nations family which has a rich history. The totem pole was carved by Rick Sewid and Max Chickite, both renowned carvers. Campbell River is surrounded by ocean and mountains. It has many old and new traditions and still retains a small town friendliness. Why not come and visit, and discover this beautiful North Vancouver Island city. Of course, the city is also well known as the “Salmon Capital of the World” and the Mecca of Eco-Tourism of Vancouver Island. There are many other attractions near Campbell River such as Mt. Washington shown here. Campbell River Visitor Centre’s website is www.campbellrivertourism.com .